By Andre Damon Threat of a recession in the US sent shockwaves to major indices worldwide Monday, forcing lawmakers in Washington to rush a stimulus package before the House floor, which was approved immediately today by a two third majority. The mood on Wall Street is gloomy at best while the Federal Reserve moved to lower interest rate, paving the way for home buyers to secure a 30-year fixed rate at as low as 5.14 %, making it the lowest it has ever been in 45 years. Despite these latest moves, it remains uncertain how long this economic downturn will last. Speculators, who prepare to roll the dice, have already hunkered down, hoping for better days. How long can the wait last? In this article, Andre Damon explained the Wall Street impact on other stock exchanges around the World. Stock prices plummeted worldwide Monday, amid heightened fears of a US recession. While over the course of last week US financial markets suffered the worst fall since 2002, with the Dow Jones Industrial Average dropping by 5 percent, many Asian and European indices dropped by a similar amount in just one day. It was the biggest one-day fall in world stock markets since September 11, 2001. Industrial stocks fell together with financial, suggesting that the US credit crisis, hitherto confined mainly to the banking and mortgage sectors, is spilling over into the real economy worldwide.India was the hardest-hit, as the Bombay Stock Exchange Sensitive Index fell by a record 7.4 percent, despite the Indian stock market having fared relatively well over the course of the past two weeks. Some analysts had begun to conclude that India would be resistant to problems in the US economy, but this view lost credibility as stocks plummeted on Monday.Similarly, Brazil’s Bovespa index, another bellwether of the so-called emerging markets, tumbled by 6.6 percent, pushing it down by 20 percent since the beginning of the year.“The perception that the US will face a recession has spread,” Luiz Sedrani, head of equity at the Sao Paulo-based Banco Votorantim, the financial arm of Brazil’s largest diversified industrial group, told Bloomberg news. “Brazil will suffer because a slowdown in the US will reduce demand for commodities, which make up most of our exports.”Major stock indexes in Hong Kong and China also fell significantly. In Hong Kong, the benchmark Hang Seng Index plunged 5.5 percent, and the Chinese benchmark Shanghai Composite Index fell 5.14 percent, despite the fact that the Chinese stock exchange is relatively closed. The Bank of China, one of the country’s major finance houses, announced that it would take higher losses than expected from write-downs of US mortgage-backed securities.The Tokyo Nikkei 225 index lost almost 4 percent of its value on Monday, and some 13 percent since the start of the New Year. Monday’s closing value represented a two-year low. Likewise, many Southeast Asian markets have fared even worse than the US over the past few weeks. Since the start of the New Year, the Dow Jones index fell by 8.9 percent. By comparison, benchmark indexes in Australia, Hong Kong, India, Japan, the Philippines, and South Korea have all fallen by over ten percent over the same period. Singapore’s benchmark index fell by six percent on Monday alone.Asian economies have their own problems outside of a prospective fall-off in exports caused by decreased US consumer spending. Some analysts have noted that Asian central banks, particularly those of China and Taiwan, are currently more concerned with inflation than with the dangers of negative growth.European indexes were also hard hit. The Frankfurt Xetra Dax fell by 7.2 percent, and the Paris CAC-40 by 6.8 percent. The London FTSE 100 took its biggest hit since its formation in 1983, losing some 5.5 percent of its value. The Spanish stock exchange fell by more than seven percent, in its worst day since 1991. There was a corresponding flight to safety as stock indexes tumbled and investors bought up government securities. Yields on German and UK federal bonds fell sharply.The rapid sell-off was partially driven by losses in the financial sector, as bank and bond insurance equities took significant losses amid fears that banks would write off more debt contaminated by US subprime mortgages. Shares in Germany’s Commerzbank fell by 6.7 percent, after its chief executive said the bank would announce more debt write-offs in the fourth quarter of 2007, and that more write-offs would likely follow.France’s Société Génerale was even more strongly affected by rumors of further write-downs; the bank’s stock fell by 8 percent on Friday, and a further 7.3 percent on Monday. Switzerland’s UBS, which had already written off some $13.7 billion in debt, lost 4.7 percent of its value on Friday. The US stock market was closed on Monday, but is expected to react negatively when it reopens on Tuesday. Futures tied to US stock indexes fell sharply.European insurance agencies were among the biggest losers, amid investor concern that bond and other debt insurers could go into default owing to the sheer amount of debt that has been written off. Fitch Ratings downgraded its credit rating for Ambac, the second-largest bond insurer, on Friday, partially triggering Monday’s panic.European and Asian banks own significant quantities of securities based on US subprime debt, some of which has been already written off as worthless. Investors are concerned that banks will write off even more debt as the US housing market continues to deflate and more American homeowners are driven into foreclosure. The insurance companies covering subprime-based securities also took a beating, as investors became concerned that they would not have the funds to make good on their claims if more write-offs were announced by the banks.In the longer term, there is a significant risk that a recession in the United States will have a devastating impact on the export-led economies—in particular China—which are highly dependent on US consumer demand. Moreover, the prospects of recession are certain to lead the Federal Reserve Board to make further cuts in interest rates, leading to a depreciation of the US exchange rate and with it the value of Asian assets denominated in dollars.The huge fall in global equities markets indicate nothing if not the utter inadequacy of the fiscal stimulus package put forward by the Bush Administration last Friday. The package, valued at some $145 billion dollars, or one percent of gross domestic product, will come mostly in the form of one-time cash rebates for taxpayers along with new corporate tax cuts.To put the measure in perspective, US household debt is now more than 100 percent of GDP, up from approximately 80 percent in 2003. Given the current rate of debt accumulation among consumers, the stimulus package will put a tiny dent in overall debt accumulation by US households, and its effect on consumer spending and the foreclosure rate will be almost negligible.The opinion pages of Monday’s Financial Times exemplify the thinking that led to the sell-off. In a column entitled “A fiscal stimulus offers limited help,” Clive Cook notes that the injection of cash from the US federal government will likely have little effect on consumer spending, partially due to the high debt accumulation among consumers. Moreover, he writes, “confidence in the economy continues to plunge; on some estimates barely a third of the downward adjustment in house prices has happened; and the end of the credit crisis is not yet in sight.” The column concludes, “Imminent fiscal stimulus notwithstanding, the heavy lifting on stabilising the US economy will therefore continue to be done by the Fed.”Wolfgang Münchau, another Financial Times columnist, argues that rate cuts by the Federal Reserve are also likely to be limited in their effect on the real economy. 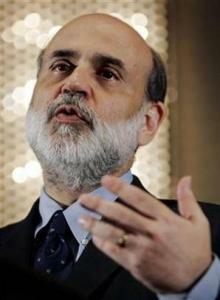 He writes, “There are recessions like the one in 2001, which respond well to a monetary policy stimulus. But not all do. This is going to be one of those.” Perhaps most notable is the fact that Münchau refers a prospective downturn as “the 2008 recession,” taking for granted that one is imminent if not already in progress.He continues: “Do not be fooled by anybody who says that the central bank should cut interest rates for the benefit of innocent citizens who have been caught up in this maelstrom. The first, second and third beneficiaries of the Federal Reserve’s pending helicopter drop of cash will be banks, not ordinary people or companies.”While the columnists make strong cases against the effectiveness of either the proposed fiscal stimulus or Federal Reserve Board rate cuts, they do not put forward any convincing alternatives. The overall sense is that the worldwide plunge of the stock markets is symptomatic of an insoluble crisis of the world capitalist system that has emerged with the bursting of the speculative subprime mortgage bubble in the US.Note: This article was first published on the WS site.